If you didn’t already know this about me, I hate to cook. It’s annoyingly time-consuming. I don’t particularly care for food-shopping either, especially now. Have you seen food prices recently? Unfortunately, I do like to eat. Lucky for me I don’t have a highly refined palate, so I’ve perfected a few dishes that are cheap, easy, tasty, etc. Me: How about if I make pasta? Husband: That’s fine. Okay. Sure. 1 lb. of ground something. Pork, chicken, turkey, beef. Personally, I like ground pork. It’s lean and tasty, cheaper than beef and breaks up nicely. Brown that and then throw in some chopped onions and let them cook down. You can throw in whatever you want, actually. Mushrooms. Peppers. Squash. When it’s cooked some, dump in a jar of spaghetti sauce. Doesn’t matter what size. I use a 24-26 oz. size. But you can use a bigger jar of sauce if you’re trying to feed a lot of people. They just won’t get as much meat. Drain the pasta when it’s done. Throw it in the pot with the sauce and stir it up and let it be together for a few minutes. Throw some shredded cheese on top. Doesn’t matter what kind. You are done. Wait until the cheese melts and start dishing it up. You can have this ready in 30-40 minutes. Frankly, it’s about as easy as buying something frozen and nuking it and it will taste better and plus you’ll know exactly what’s in it. I think you can make this for maybe $5-6, depending on where you shop and it could potentially feed 3-4 people. I’ve had to learn to cook for two people. The husband’s not too crazy about leftovers. Usually there is some left, but it’s good warmed up. You can throw a salad together if you’re ambitious. Go ahead. Make some garlic bread if you want to show me up. Or do what I do. Dish some into two bowls and tell your husband dinner’s ready. 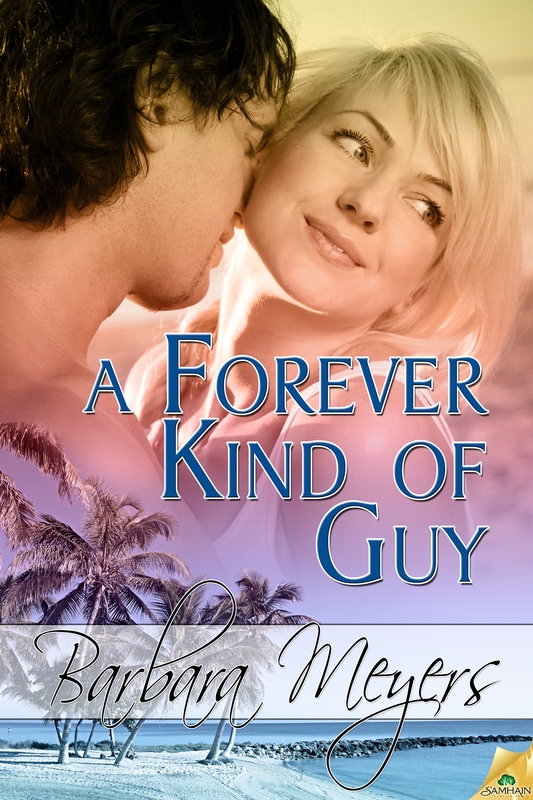 Watch for my ne xt book, A Forever Kind of Guy from Samhain Publishing October 2011.
a forever kind of guy, barbara meyers, cooking, food, meals, pasta. Bookmark.